We mostly cater to patrons booking reservations. But we also have offer special tools for concierges and a great affiliate program for food bloggers and online city guides. We reward customer loyalty.Patrons are encouraged to visit restaurants more frequently with VIP status and perks for loyal customers. We value transparency. Affiliates get credit for referrals, and venues can track their marketing campaigns with detailed analytics. We treat concierges with respect. Concierges receive perks for their guests, short notice bookings, and rewards with special concierge only accounts. 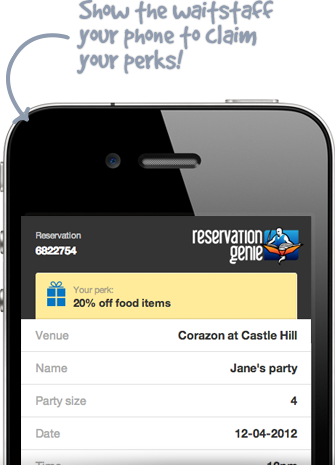 Looking for an Online Reservation System? Other reservation systems seem focused on charging cover fees. We're all about smart tools that encourage customer loyalty, measure your advertising, and grow your referrals. What Does the Genie Have to Say? We love the internet and all the smart ways you can use it to generate more business. On the Reservation Genie Blog we share ideas on getting more out of your online marketing.